Image: Anna Isaeva/Swillklitch/Getty Images. Design: Ashley Britton/SheKnows. Ever since my twins were babies in the stroller, they have seen me drink alcohol. While I’m not the type of person who drinks daily, I do enjoy my beverages on a semi-regular basis. This could include wine with dinner, cocktails with my girlfriends or just an ice-cold beer at the end of a long, hot summer day. 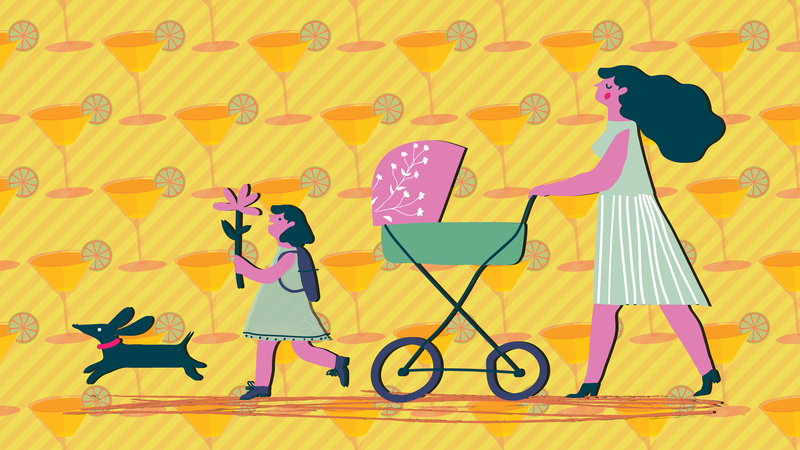 My enjoyment of alcohol didn’t stop when I became a mom; in fact, it probably increased. Thankfully, I’ve always had a healthy relationship with alcohol, which means that although I like it, I can take it or leave it. I don’t need a glass of wine to unwind at the end of the day — but sometimes, when the mood is right, I do like to have one. I never thought this was something to hide from my kids or something they shouldn’t see me doing. Growing up, my parents drank occasionally, but alcohol was never taboo in our household. The liquor cabinet wasn’t locked — which was probably why we never had that teenage fascination with trying to get to the "taboo" booze. Alcohol wasn’t something we wanted to sneak. In a strange way, I almost felt respectful of it. When my kids see me mixing drinks for friends or drinking wine in the park during an outdoor concert, they aren’t watching someone drink to get wasted; they are seeing an adult doing an adult activity and keeping herself in check. I never forget that taking care of my kids is my first responsibility, and because of that, I’ve never gone too far when I do choose to imbibe. When my family lived in Brooklyn, it was normal for parents and kids alike to convene at the beer garden in an atmosphere where adult and kid fun could coexist. Parents could drink and talk while kids filled cups of water, ran around and played with one another. Of course, this wasn’t the only thing we did, and there were many alcohol-free afternoons spent at the playground or park. But it was nice to know that our kids could be present in this adult atmosphere — that those two worlds didn't have to be mutually exclusive. More: Do You Really Have to "Pump & Dump"? These days, parents are so hyper about what kids are exposed to. Forget alcohol — even having the wrong juice box without 100 percent sugar-free organic ingredients can feel verboten. But I remember my own grandpa asking us to measure out “two fingers” worth of scotch when we were kids; to me, that was totally normal (not to mention super-cool). More: Is Smoking Weed in Front of Your Kids Ever OK? Recently, at an outdoor concert in our new hometown, I hesitated about whether to bring wine. Would onlookers see this as “bad parenting”? I mean, I know there’s a big difference between enjoying a glass of rosé in a park and swigging from a bottle of malt liquor at the PTA meeting, but the anxiety did cross my mind. Ultimately, I decided to go ahead and uncork. My kids thought it was totally normal, and so did I — and if anyone thought otherwise, I probably wouldn’t want to hang out with them anyway. Do I advocate doing shots in front of your children and shotgunning a beer as a chaser? Of course not. But if you want to enjoy a drink, don’t do it in the bathroom. Your kids can handle seeing you behave like an adult. In fact, handling the adult stuff like the responsible pro you are is the example you should be setting for them — all the time.